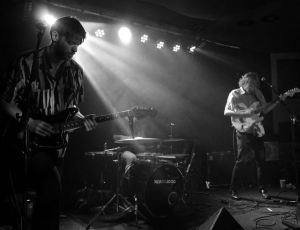 Rubber Jaw are a 3 piece band from Elmstead Market, Essex formed of frontman Michael Hemmings, guitarist Ross Connel and drummer Archie Mann. They’ve released their debut single ‘Feeling Funny’ on Alan McGee’s new 7″ boutique label Creation23. Starting out with just childhood friends Michael and Ross, the band found drummer Archie and decided to give the band a proper shot. The decision was a wise move, not only have they been picked up by Creation23 but they have also gained support from BBC Introducing, This Feeling, Sofar Sounds and had radio play on BBC Radio 6. I caught up with Ross and Michael earlier today to get the low down on all things Rubber Jaw. For all those folk who have been hiding under a rock, can you introduce yourselves and please tell me a little about how you got together? We are Rubber Jaw, a three piece music maker from Elmstead Market, Essex. It started when we (Michael and Ross) met up, whilst back home in between years at university, just to record a couple of half ideas we had. We liked what we did so much we goaded each other into not going back and giving it a shot. Things progressed from then on, we wrote and recorded a load of songs and put together a live set. Then we did our first gig… it was with a backing track for the drums. It was awkward and we knew we needed that live energy. That’s when Archie joined us, we found him after we saw a video of him drumming in a field, he looked like a man possessed. It’s on the fringes of Art Rock/Indie/Alternative; in the centre of that Venn diagram. Who were the strongest influences in music that contributed to you producing the music you are releasing today? We often reference bands when writing songs to get an idea on how the finished song should sound. We love how big and open the first three Arcade Fire albums are and they’re great writers of melodies. St. Vincent also comes up a lot, the guitar tones and weird glitches. You signed to Creation23 earlier this year, Alan McGee’s new 7 inch label. Can you tell me a little about how that came about? We recorded ‘Feeling Funny’ and shot the video for it in our garage and, because it was the first track we recorded, we ended up sitting on it as we were unsure what to do with it. We ended up sending it to some people we had known from previous bands and with a huge stroke of luck it ended up on McGee’s lap. He said he was thinking of starting a label and wanted us to be his first signing and that was that. Tell me about the single ‘Feeling Funny’ what’s it all about and where did the inspiration for the track originate? We try and keep the subject matter vague and open to interpretation. The worst feeling is when you think a song really relates to a significant point in your life and it ends up being about the songwriters dog. It has a significant meaning to us but it’s up to the listener to instil their own meaning. If you had the opportunity to support any band, at any venue of your choice, who would it be and why? Flight Of The Concords, any venue really… just want to be their friends. For me (Ross) Biffy Clyro – Wembley Arena, such a good time, fun fact, you can see me in the mosh pit on the DVD. For me (Michael) it was Bon Iver headlining Latitude Festival. You recently played at BBC Introducing LIVE and I must say it looked great, what were the highlights of the day? BBC Introducing have been very kind to us, they’ve got us airtime on BBC 6 Music, BBC Essex made us their track of the month and we have done sessions for both BBC Essex and Suffolk with them both championing us. So the best part of the day was chatting to the people that had helped us and seeing the good they were doing for other bands in similar situations… the free beers were really good too. What has been the standout moment for the band so far? We’ve had so many it been mad. Seeing our vinyl for the first time was one. Sofa Sounds was great, as was This Feeling TV. We had a surreal night at our hometown show, the place was sold out and people were singing a long to all the songs. Mad! I mean it’s hard to beat the moment we signed to Creation 23, but I think shaving Archie’s head might just edge it. Rubber Jaw play on This Feeling TV and then chat to Radio X’s Elspeth Pierce. What are the plans for Rubber Jaw going forward? Can we look forward to new music anytime soon? Any live dates or an upcoming tour you’d like to shout about? We’re heading into the studio in January. We’ve also got some tour stuff in the pipeline so stay tuned on Instagram and Facebook to keep up-to-date. However, you can catch us at The Social on the 18th December alongside Young Garbo and Alan McGee.